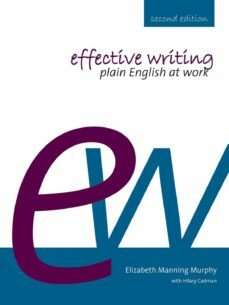 Effective writing: plain English at work, second edition, is about writing that works: it is based on sound English grammar and plain English style. If you want to write in a way that is clear and meaningful, to avoid writing ‘gobbledegook’, and to be able to explain effective writing to others, this book is for you. Through this book you will gain the skills needed to write cohesive paragraphs and to consider your target audience. This updated edition also considers writing emails, material for websites, and other workplace writing that wasn’t covered in the first edition. - How do you explain to a colleague why their writing ‘doesn’t make sense’? - Why does choice of font matter in a document? - What is appropriate use of social media in the workplace? - Why is white space important in an email and in a printed report? Many such questions are answered here. You can practise writing and check your progress by doing the activities after every topic. Use this book as a self-tutor or as a class textbook.